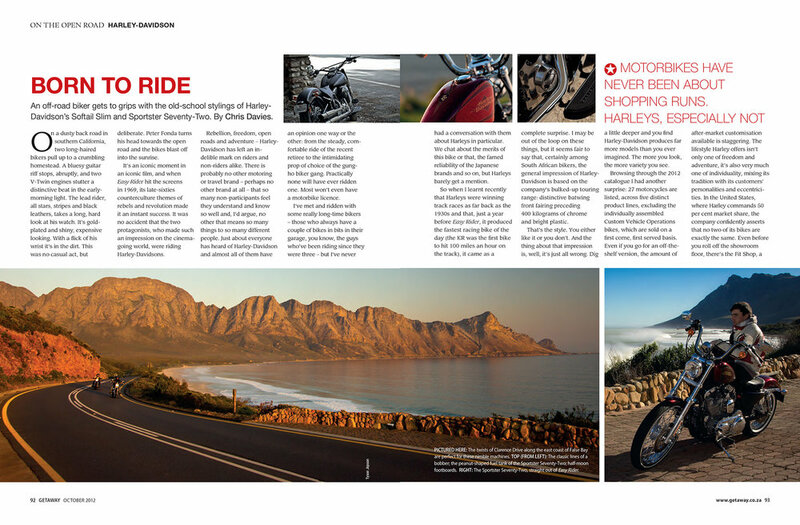 Riding the latest Harleys on some of Cape Town's most beautiful roads. "Rebellion, freedom, open roads and adventure – Harley-Davidson has left an indelible mark on riders and non-riders alike. There is probably no other motoring or travel brand – perhaps no other brand at all – that so many non-participants feel they understand and know so well and, I’d argue, no other that means so many things to so many different people. Just about everyone has heard of Harley-Davidson and almost all of them have an opinion one way or the other: from the steady, comfortable ride of the recent retiree to the intimidating prop of choice of the gung-ho biker gang. Practically none will have ever ridden one. Most won’t even have a motorbike licence."